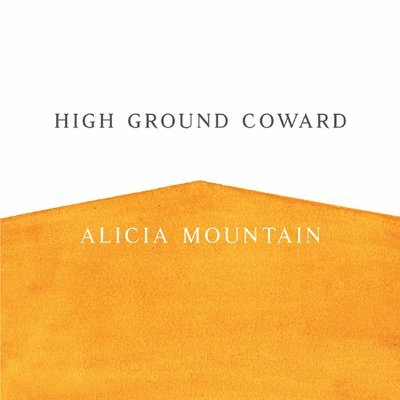 Alicia Mountain’s debut collection of poetry High Ground Coward, winner of the 2017 Iowa Poetry Prize, concerns itself with what it means to live in our world as a sensitive, observing person, one who desires and is desired, cares and is cared for, engages with the material of one’s surroundings and is also alienated from it. The book opens with the line: “My desires are berries because they are small and many” and truly this book is full of little poems, little promises of exploding flavor and possible satiation. One of the enduring motifs in the book is the construction of “the twins of us.” This theme, employed primarily as a gesture toward the beloved figure of the speaker’s “not-wife” is striking and sweet. The twins seen from the perspective of the narrator of the poems are both the observing self and the observed/performing self. Mountain places the reader in the intimate space of the childhood bedroom at a slumber party, where one can watch from above, as in a movie, as the twins of yourself and your lover take turns playing with each other’s hair and make out. She also complicates this gesture, bringing in fears of death or of being implicated in some larger social consumption. Mountain undercuts this all with a deft humor (the raccoon’s tiny human hands, the persistent fear of disappointing the people who look at teeth for a living). The humor underscores the very real emotions. with bare arms cold in the dairy. I know who you cook dinner for. I know what they like to eat. grow something red and sweet and bitter in the garden. The poem is deceptively simple and straightforward. It brings to mind Ginsberg’s “A Supermarket in California”—a surreal vision of almost-reality, an almost touchable and tastable life. “The twins of us” function as the speaker and her beloved, sure. But they are also the reader and the speaker; the “you” is invited into the poem, as an actor. These poems explore how we hold the ones we love, both as their real selves and as the selves that our love is projected onto. To know your own self is also to be twinned in that way. What is a love poem, anyway? A doubling and then a flattening of two or more selves into one, a reserve-motion mimesis. to see their mom and she will be locked up for years. of my house and somebody else shovels a bent path around it. for drugs or money or something that you needed? There must be a write off in all of this. The insistent “I” of the poems carries High Ground Coward. There is a very clear point of view and point of focus. How do you read such an intimate speaker, a speaker so grounded in this world, so clearly concerned with people, the places she inhabits, the sufferings and joys of the world, without projecting some of that back on the poet? It’s an inviting voice, a friendly voice, one you can trust. to carry loss like a back pocket flag? The speaker is in a legacy of pain, but is stationed at the door. In some poems the speaker is a kind of social worker, the professional manager of appointments, pain, and accommodation for her clients. illness like it’s a gelding, saddled and lame. No side effects, though. Only effects. He is trying to let this life go quick. I used to run everyday, he says, I used to be undetectable. I repeat this aloud at home in the blue-dark kitchen. Undetectable. I stare into the fridge. Undetectable. I’ve forgotten what I’m hungry for. Undetectable. I have the thought that I am crazy. Is this how it begins, with voices? She feels implicated, wanting to help and unsure of how to. Many of the poems are narratives, stories and insights into the world of a speaker who is caring and careful but whose carefulness is made irrelevant by some external weather. In “Auxiliary File For Not-Brian” we see the same figure on her penultimate day as a caseworker. But there will be a new case manager, soon. There is a closeness and distance of these two people. They can both feel what they owe each other. High Ground Coward is primarily a study of how one can live as a caring, careful person. There is much to like in Mountain’s work. It’s friendly. Or it’s right there. The voice feels familiar. It’s my voice. It’s your voice. It’s the possible ways of being. Emily Brown‘s writing has appeared or is forthcoming in Prelude, Sonora Review, The Des Moines Register, Bennington Review, Lambda Literary’s Poetry Spotlight, The Dead Animal Handbook, and elsewhere. She is an editorial assistant at Poetry Northwest and received her MFA from the Iowa Writers’ Workshop.